Sometimes when I’m cycling they’ll be directly on the road in front of me, eating something that even I wouldn’t. As the bike seems about to hit them they opt not to fly swiftly to immediate safety some distance away but instead to just casually step to the side out of the way and wait for the bicycle to pass. 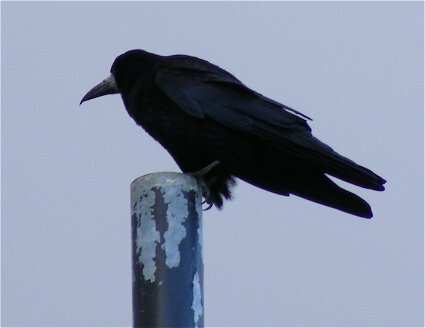 This rook is pictured on top of a GAA goalpost. Crows do the same thing. I love their arrogance. Martha - Yes, very much a family thing. Manuel - Or of Dublin. There was what looked like a raven on the old Dublin County Council crest although the GAA for some reason always went with the 3 castles of Dublin city (and on score boards in Irish it’s the city name rather than the county name that is mostly used). The raven meanwhile moved to the crest of Fingal. Nick - How do feel about those other crow-family members, the (Eurasian) jays, and their distant American cousins, the blue jays? They more put me in mind of magpies than crows, rooks, ravens or jackdaws.